Even tastier than I expected, this was borrowed from Ina Garten’s newest book, ‘Cook Like a Pro’. I used mostly bone broth (from the freezer) and had the rest of the ingredients either sitting out or at least partially prepped so it made for a fantastic weeknight meal (twice! it was a busy week!). 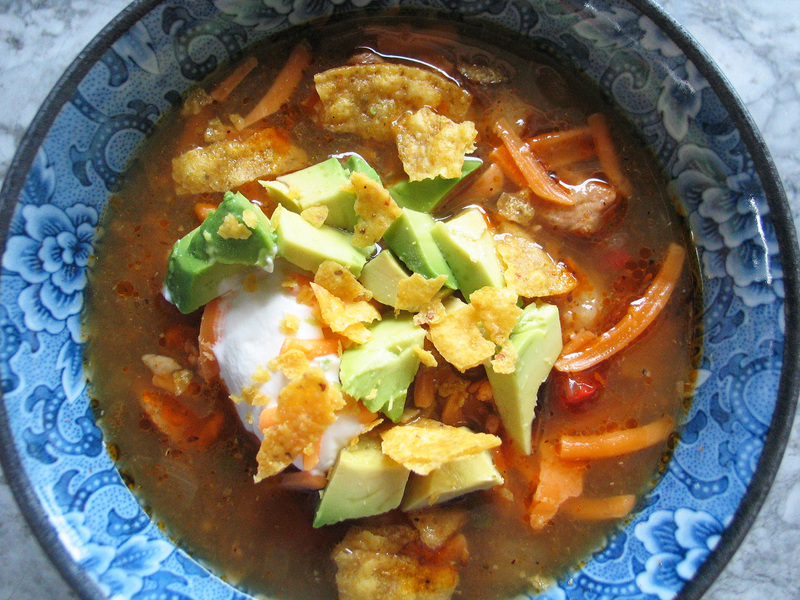 The only bit I changed was to leave the tortilla chips out of the soup itself and instead allowed for everyone to add as many chips (and other assorted garnishes), as they wished, to their own bowls – enjoy! 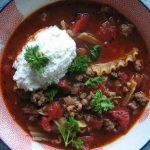 Heat up about 3 tablespoons of good olive oil in a large soup pot or Dutch oven over medium-high heat. Add the pork, sprinkle all with a bit of salt and a lot of freshly ground pepper and brown lightly on all sides. Transfer the pork and any liquid to a bowl and set aside. Add another couple of tablespoons of oil to the pot and cook the onions for a few minutes until softened, then add in the poblano and bell peppers and saute for another few minutes. Add the garlic, chili powder and oregano, cook for 1 minute, then add back in all of the pork and juices. Pour in the chicken broth (start with 6 cups) and the salsa verde, give the soup a good stir and bring it all to a simmer. Stir in the hominy, black beans, 2 teaspoons of salt and 1 teaspoon of pepper, bring it all back to a simmer and then taste for seasonings. I used a total of 3 teaspoons of kosher salt – add more broth if you feel it needs it. Simmer the soup for about 30 minutes, stirring occasionally and then ladle it up into large bowls, making sure to leave enough room for all of your garnishes!